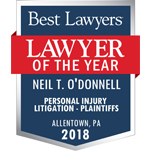 Kingston, PA – Best Lawyers has chosen Attorney Neil T. O’Donnell, owner and founder at O’Donnell Law Offices, “Lawyer of the Year” for Personal Injury Litigation—Plaintiffs in Allentown. Attorney O’Donnell has been recognized by Best Lawyers for the last 5 years. Additional recognitions are also awarded to individual attorneys with the highest overall peer-feedback for a specific practice area and geographic region. Only one attorney is recognized as the “Lawyer of the Year” for each specialty and location. For more information, please visit www.bestlaywers.com.